Australia should refuse to allow migrants or refugees with HIV to enter the country, Prime Minister John Howard has said. Mr Howard said there may be special cases when an exemption could be considered but as a rule HIV-positive people should be denied entry. Mr Howard was asked about the issue during a visit to Victoria state, which has seen a sharp rise in HIV cases. 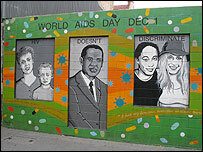 Any ban for migrants with HIV/Aids would need a change in the federal law. Mr Howard, on a visit to Melbourne, told a local radio station he wanted to seek more advice on the issue, but said his gut feeling was that HIV sufferers should not be allowed in to the country. "My initial reaction is no," he said. "There may be some humanitarian considerations that could temper that in certain cases, but, prime facie - no." Victoria's public health officials have blamed the rise in HIV cases partly on overseas immigrants, but also on Australian residents relocating from other parts of the country. 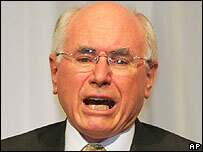 Mr Howard, who has been in power for 11 years, is known for his tough stance on immigration. He likened his proposed ban to the ban already imposed on people suffering from tuberculosis. "I think we should have the most stringent possible conditions in relation to that nationwide, and I know the health minister is concerned about that and is examining ways of tightening things up," he said. Solicitor David Puls of the New South Wales HIV/Aids Legal Centre said the law allowed immigrants to be denied access where there are public safety concerns. "The Medical Officer of the Commonwealth does not consider HIV to be a public safety concern," he was quoted by the Australian newspaper as saying. He added that HIV should not be compared with tuberculosis as the latter is airborne and contagious, while HIV is transmissible but not contagious. Australia has been alarmed by the country's rise in HIV cases. Infection rates rose by 41% between 2000 and 2005. There is particular concern about the rapid spread of HIV and Aids in neighbouring Pacific countries, such as Papua New Guinea.